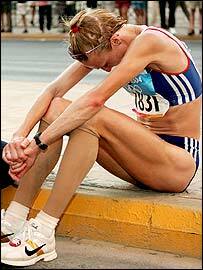 Paula Radcliffe after dropping out at mile 23 of the Athens' Olympic Marathon. The full story from the BBC..
Having run and paced over 90 marathon+ races, I've seen a lot of mistakes. This is list is the biggest mistakes I've seen in the marathon race, and I have a separate list of marathon training mistakes. The most common mistake I see is runners overdressing for the conditions. For most runners, the ideal temperature is about 40f/4c, and anything above that will slow you down even if you're minimally dressed. Wearing additional clothes just makes this worse, and I commonly see runners wearing far too much, soaked in sweat or covered in salt stains. Most of the runners I pass who have been reduced to walking are overdressed, and they're not cold even when moving slowly. Part of the problem is that when a runner is likely to overheat, the subconscious reduces muscle fiber recruitment well ahead of their core temperature becoming dangerous. This means that a runner will feel tired rather than hot, especially in temperatures below about 60f/15c. When running a marathon you should aim to feel slightly cool, but not shivering. If you're sweating, then you need to shed clothes until you're in equilibrium or you've reached the point of being minimally dressed. If the temperature is cool at the start, then wear extra clothes on the start line that you can throw away in the first mile or so. After that you want to be able to control your temperature, so having a top that you can take off or unzip, along with hat/gloves can work well. If the race temperature is above 40f/4c, then you will be slower than you would be in colder conditions, sometimes a lot slower. Failure to allow for this heat stress will mean a catastrophic slow down later in the race, and can result in heat illnesses. Wearing dark clothes can make the heat far worse, so wear white. Ideally you will have chosen a race that's going to be chilly, but if not you will need to adjust your race goal. Most runners tend to break The Golden Rule of Racing to one extent or another. The rule is 'never do something in a race you have not practiced in training'. Most of the time these breaches are minor, such as trying a new flavor of Energy Gels. However, some breaches of the rule have more serious consequences. The classic breach is to run in new Shoes which can often lead to blisters. Often this mistake is linked to training mistake number three, 'lack of Race Simulation'. In some ways the worst thing about this mistake is that the runner concerned is usually aware they're being foolish and continue anyway. Going out too fast at the start of the marathon is remarkably. This is caused partly by the excitement of the race, but also by the optical illusion of having runners around you. On most training runs we have nobody blocking our vision, so we see our forward motion represented by the ground and scenery appearing to move towards us. At the start of most marathons all we can see is other runners, and many of them are going faster, so it appears we are either stationary or going backwards. This optical illusion makes it hard to judge the actual pace. The consequence of Going out too fast can last for the whole race. This initial high intensity creates an oxygen debt that increases Glycogen usage and can upset in the metabolic processes. Expecting to be able to run a marathon in a much faster time than your ability will allow is a far more common mistake than it should be. In most marathons I run, I come across people walking slowly towards the finish line from about mile 18 onwards. These runners had an unreasonable expectation and set out at a pace that they could not maintain. It is vital that each runner spends time predicting their race performance, and these predictions should be based on hard evidence, not guesswork. There are workouts such as Yasso 800s that can help predict marathon performance, but the best predictor is from a shorter race. Ideally this should be a half marathon run a month or two before the main race, but a 10K, or even a 5K can help. The performance in these shorter races can be used in a calculator such as my Running Calculator to predict marathon performance. Many marathons provide pacers that will help you stay on pace. These are normally experienced runners who can hit their target time without much effort, and will keep things steady. They will help you avoid going out too fast, and can provide motivation late in the race to stay on pace. I've had many runners come up to me after I've paced a race to thank me, and I've also had runners tell me how much they regretted not using the pace group, often after I pass them late in the race. Few runners seem to take sufficient fuel during the marathon. It is generally impractical to get enough calories from the provided sports drink. Unless you actually stop running it is very hard to drink more than a couple of fluid ounces from a paper cup, and most of the time the sports drink is poorly mixed and all you're getting is colored water. The primary source of fuel in a marathon should be Energy Gels as these provide a convenient and predictable supply of calories. These gels should be taken throughout the race, rather than leaving it until the latter stages. I recommend taking the first gel just before the start of the race, then space them evenly through the distance. On hilly races runners will sometimes try to keep their pace even, which means they are running at a much higher intensity on the uphills and a much lower intensity on the downhills. This is a bit like doing sprints in the middle of the race, which causes premature fatigue. Also, because Glycogen consumption increases disproportionately to pace, the higher intensity on the uphills will deplete the Glycogen reserves more quickly. This Glycogen depletion is a classic cause of 'hitting the wall'. Instead of maintaining an even pace on the hills, you should aim for an even effort. If you have a Heart Rate Monitor it will give you a good indication of your effort. Alternatively your Breathing and general feel should give you a sense of intensity. You may find that you need to slow up more than you expect on the uphills, as well as speed up more on the down hills. If you've practiced Downhill Running then you'll be efficient on the downhill sections and overtake those that passed you on the uphill. Racing the marathon distance requires dedication and courage but sometimes the strengths can lead to runners ignoring injuries that should prevent them from competing. Carefully weigh the risks and consequences of racing with an injury. Racing the marathon distance always involves suffering. A well raced marathon will mean The Last 10K is a living hell, barely holding on to the race pace. (If the living hell is accompanied by dramatic slowdown in pace, then it is not a well raced marathon but an example of hitting the wall.) It is important to mentally prepare for the marathon distance by both building fortitude and learning techniques for dealing with the suffering. Over-hydration is where you drink beyond your thirst, and can lead to a condition called Hyponatremia. Over-hydration tends to be a problem for the slower marathon runners, typically slower than a four hour finish. Over-hydration will lead to weight gain which will impair performance. However, in rare instances it can become life-threatening and is one of the few things you can do in a marathon race that will kill you. It is vital that you drink to quench your thirst only. This was my number one mistake, as it's the one that's most likely to kill you, but over the years the advice to drink excessively has been gradually replaced by "drink to thirst". Getting your pre-race meal right can help ensure you're not starting off Glycogen depleted. However, it's even more important not to eat something that causes digestive problems. This mistake requires careful practice on your Long Runs, especially if your long run is at a different time of day from your race. Some runners like to eat oatmeal (porridge), others banana or bagels, but whatever works for you, practice is repeatedly until you're sure. This page was last modified on 25 November 2015, at 12:32.